TS Gurukul RJC CET 2019: TSWREIS RJC CET 2019, TTWREIS RJC CET 2019, TS Social Welfare RJC CET 2019, TS Tribal Welfare RJC CET 2019 - TS Gurukulam RJC Entrance Test for TSWR Inter 1st year Admissions and TTWR Inter 1st year Admissions. TS Gurukul RJC CET 2019 for Inter 1st year admissions into TSWR, TTWR Junior Colleges in Telangana State. TS Gurukul RJC CET 2019 for TS Gurukulams Inter First Year Admissions 2019, Telangana Social Welfare, Tribal Welfare Inter 1st year admissions 2019, TSW, TTW Residential Junior Colleges Inter Admissions 2019. 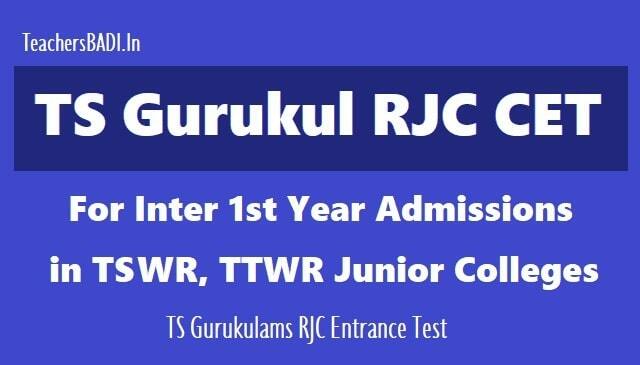 TS Social Welfare and Tribal Welfare Junior Inter admissions 2019 through TS Gurukulams RJC Entrance Test 2019: Telangana Social Welfare Residential Educational Institutions Society (TSWREIS) has issued the TS Gurukul RJC CET 2019 notification on April ..., 2019 for intermediate 1st year admissions in TTWR and TSWR Junior Colleges in Telangana for the academic year 2019-2020. The TSWREIS officials are inviting the online application forms from the eligible SSC passed Boys and Girls for admissions into Junior Intermediate into 127 TSWRJC and 49 TTRJC Institutions in the State. The following are the instructions to apply for admissions. a. Must have passed the qualifying examination in first attempt in March, 2019 as regular candidate. b. Candidate must be a resident of India and must have studied in TELANGANA only. c. Candidates who have passed in earlier years are not eligible and need not apply. 2. Spl category Reservation: PHC: 3% within community quota. 2. Spl. Category Reservation i.e., PHC 3% and Sports Quota 3% within ST community. 1. Question paper shall be issued in Telugu/English (bilingual) only. 2. Test will be conducted in Objective type (Multiple Choice) for 150 Marks (30 marks each for English, Maths, Physical Science, Bio-Science and Social Studies irrespective of groups. The duration for the test is 2½ hrs. 3. The Model Question papers are available in the Website: www.tswreis.in. The question papers of GURUKUL JC CET will be based on 10th standard in Telangana state syllabus for subjects and English will be General English. All the TSWR & TTWR Junior Colleges are providing education in Residential Mode with experienced and highly qualified teachers. E Plus Club for better communicative skills in English. Conduct Summer Camps to develop the Skills among the students. Earn while learn, Green Gurus, Teaching Assistant Programmes. Bharth Darshan to get acquaintances with different places and culture. Nutritious, Delicious food which super fine rice. Providing Non-vegetarian once in a week. Supply of Egg and Banana Fruit daily. House Parent system is implemented by appointing staff as House parents to each section and the House parents shall monitor the academics, health and relative issues of the students round the clock. Day starts with the physical exercises and Classes will commence at 8.15 AM and academic activities will continue till 10.00 pm in the night. Apart from the academic activities, importance is given to sports and games and other cocurricular activities for all-round development of students. TSWR & TTWR Junior Colleges are having adequate infrastructure facilities in addition to well equipped laboratories, Computer Labs, libraries, reading rooms and play grounds with well equipped physical education department. The colleges offer free education besides free boarding and lodging facilities to all selected candidates. Special care will be taken for talented as well as low achievers. House parent system is adopted to look after and guide the students staying in the hostel. Candidates can submit the online applications through online mode @ https://tswreisjc.cgg.gov.in/. For all details visit www.tswreis.telangana.gov.in or http://www.tgtwgurukulam.telangana.gov.in/ or contact any of the nearby TTWR /TSWR School /Jr. College in the Region.